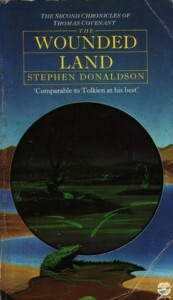 Return to the Land marked amazing experience - Donaldson moved from the Tolkien lookalike and let himself use all of the possibilities open by first trilogy and to the full extent, too. Here is Covenant, but in doubt whether he is a main protagonist, more powerful than before, yet even more sick and doubtful of using that power. Yet the most memorable thing is Land itself - the shock of returning to the once beautiful and peaceful Land, in accordance with Earthpower, now ravaged beyond belief, twisted and (almost) desecrated, all the beliefs perversely twisted and people subjected to Lord Foul without their knowledge, makes up for the small logic inconsistencies and provides an unforgettable experience.